just more of a "maybe think about it" blog. lately i've been noticing a trend in blogs, articles, etc. these articles are usually about self esteem, body image, etc. but, some of the statements made therein are not-totally-great. "who says i need to be a size 2??" "all those skinny girls look anorexic anyway!" well now, hang on there. some women ARE size 2.
and some women are size 6.
and some women are size 10.
and some women are size 14.
and some of them are thin. and some of them are curvy. and some of them are flat-chested. none of them are wrong. and they're all "real women," thank you. loving your own body is great. but saying another body type is wrong? i don't think healthy body image has much to do with throwing another body type under the bus. that mindset actually sounds like the opposite of healthy. but don't hate on skinny girls to make your point. is not an acceptable statement or joke or greeting or whatever the hezz it's supposed to be. and THAT is not attractive or OK.
don't be a mean girl. and it doesn't mean you'll automatically love everything about your body. then you have bigger fishies to fry, my friends. and before you tell me, "but you don't know what it's like! all the actresses are skinny! all the models are skinny! the media says skinny is in!" maybe you should take a closer look at what sources you are letting tell you what is "in." if you're going to listen solely to the media or any other external source to tell you what is right or wrong for your body and your life and your talents and your goals, etc. then you're always going to be disappointed in yourself. ....and that has nothing to do with being thin. 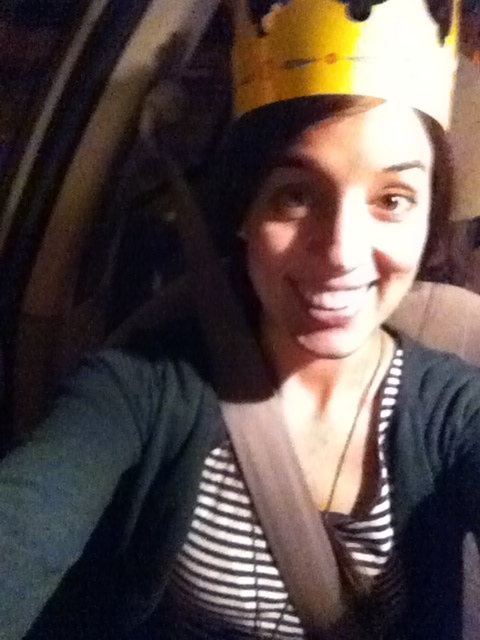 i actually think everyone's self esteem would improve if we all got to wear paper crowns at least once a day. THANK YOU!! I'm so sick of the extremes on both ends of the spectrum. Self esteem is about loving yourself, and also having the decency to respect others no matter their body size. I know for me, being "skinny" was sometimes just as difficult as someone who thinks they're "fat." Everyone is fighting a different battle, and we can't judge them based on their body size (or anything else, for that matter). I agree 100%. Putting down other bodies is not going to make you happier with your own. Some women don't have a lot of curves and some women have nothing but curves. But we're all women and we're all beautiful in our own way. I just keep thinking up of really sarcastic things to say in response to this, but I'll hold them back (hopefully). I really love this post and I think you're the best for being so honest, semi-in-yo-face and forthright. You go. Someone needs to say these things, and I'm glad it's you. If it was me, I'd get lots of hatemail and probably would feel very sad. Being someone who is on the opposite end of the spectrum in pants size, it's truly a sad thing that this can be so dividing. Sometimes I wish anything Hollywood would go away because that is seriously where we get these ideas. It's not from looking at our friends and feeling sad they're smaller/bigger/pregnant/married/driving a nice car/living large, etc. more than us. It's because we saw someone on a magazine stand at Smith's last night and then saw that friend who made us sad. Does that make sense? What I'm saying is because I saw a picture of Katniss and then you...I hate you now, instead of hating Katniss...I mean..shoot there's that hate/sarcasm. haha i love so many things about this...mostly when you randomly made a katniss reference. there are probably whole essays we could write on the fact that our self-perception is skewed because we're taking our cues about beauty, etc. from the wrong sources...which are hard to ignore, when they're everywhere. This is very possibly my favorite blog post of yours. At least in the "serious" category. Because I have lots of favorites when it comes to the "silly" category. Side note: I like that even your "serious" posts are allowed to have pictures of you in paper crowns. Anyway, this is SO ABSURDLY TRUE that it deserves world recognition. And maybe a huff article. You know, if you feel like opening that can of worms. Media is messed up. That's no secret. But sometimes telling yourself not to compare yourself to it seems like there has got to be some kind of "secret" to it. Like you said, it is everywhere. And probably always will be. But I think things like this post do a whole lot of good for the other team. So um, you rock. And so does your skinniness. And in no way does that make me hate you. You are totally allowed to look good in skinny jeans and horizontal stripes and quirky things and not have to care about what other people think. This is the bomb. You are the bomb. thank you my little sister-friend. i like your cheeks. and your freckles. Love this. And love you. Also, I almost posted this as Tim. And I'm glad I didn't. I am a size 12...and I'm of the opinion that there are several different body types for a reason too. It would be wonderful to have a metabolism, but I'm learning to love what I have and I hope everyone can do that too. Love this, amen amen amen! Totally resonated with this blog!! I wholeheartedly agree. I have my own tales of being a skinny girl and getting many rude comments based on my weight. Especially when I was younger, I was very thin (naturally) and people would grab my arms and say, "You're so skinny I can fit my hand around your whole arm!" I'm a private person and I don't want random people grabbing me. Also got called anorexic on occasion. Just not okay. I definitely had my own journey of learning to accept my body and you're right, being skinny doesn't automatically mean I love myself. I don't like it either when I see people saying things like, "Real women have curves" or "Men prefer women with some meat on their bones anyway." Blanket statements are always so dangerous when talking about a women's body. I would love to see more recognition of accepting your own unique shape and size. It's hard being a girl in our appearance-centric society! I just love this so so much. Like so much that it makes me want to cry. And I literally gasped out loud when I started reading it because I am actually working on a post almost IDENTICAL to this.. Hahah. Whoops. Don't think I stole your idea. I just found this post very timely, because I was JUST talking to my husband like 2 days ago about how it makes me mad that suddenly, skinny is the enemy, like you said. People tag it as "unhealthy", and "anorexic", and other vain things like that. It's really sad for me, because I'm a size 0 and can't help it, people! But it ABSOLUTELY does not mean I think I'm better than someone who is a size 14. No way jose. Thank you so so so so much. I just came to this post from your other one, and I know it's really old--but I just wanted to say I totally agree with you! Having a positive self image doesn't come from saying bad things about people whose bodies looks different from your own! That's ridiculous.